I wasn’t sure about including a pair of fairly casual trousers in my SWAP. I made the trews, to use a 60s word, as I started my quest for a pair of well fitting strides. This shape – fairly fitted, narrow at the hem, and curvy on the hips while fitted into the waist, with a facing rather than a waist band – is good for me. I also like a back or side zip, thereby avoiding a fly front. This gives a very nice smooth line across the abdomen (which is fine if you are fairly flat there – pleats, pockets and other distractions are useful to disguise a tummy). Everyone has a trouser shape that works well for them, and there are other shapes which work just fine for me, and I will blog on trouser shapes and fitting at a later date. 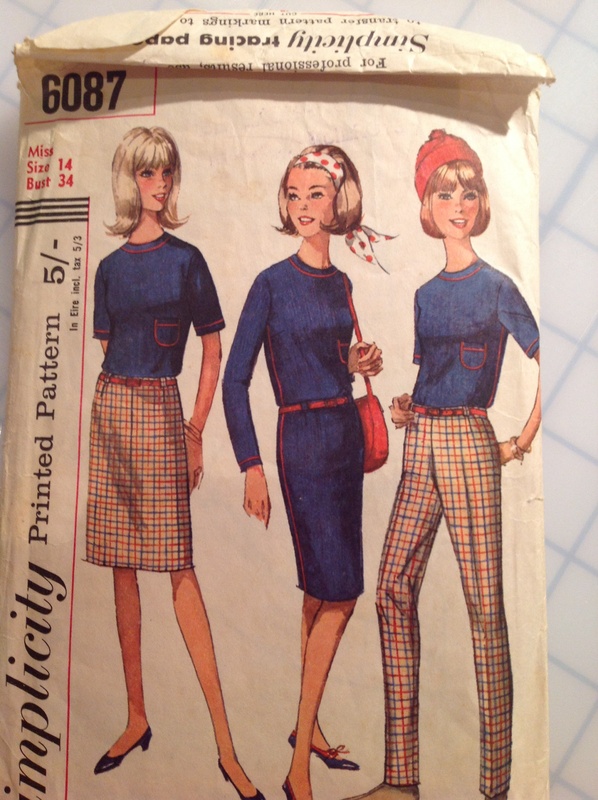 But I knew the shape I wanted and found a pattern -Simplicity 6087 – that would be about right. All trousers need careful fitting, and while these were pretty good in crotch depth and the hip area I had to reduce the side seams to fit my waist. The leg shape wasn’t great though, and I had to take the side seams in from waist to hem. And then let them out again in the calf. So quite a lot of faff. I would have preferred them an inch or two longer, although I cut them according to the pattern and I think this is the style. The ankle reveal is fine – its just I do like the option of socks and closed shoes – which is, I think, necessary for work. Having said that I have worn them a lot, especially in the summer. I chose a lovely cotton with around 3% Lycra, reputedly Roland Mouret, in a deep blue-pink that I love. The fabric came from Simply Fabrics in Brixton. They are very comfortable. They fit. But also they are made in a stretch fabric which I think we are all used to these days. The original pattern is very much for a woven, and I think that is why I had to take quite a lot out of the side seam.